Doctors have spent the start of the British Medical Association's annual conference criticising the government's use of the private sector in the NHS. But not all doctors believe private providers are always damaging. Eye surgeon Dinesh Verma used to enjoy doing a little extra work on top of his NHS duties. But that is hardly surprising. For as little as 15 minutes work, the consultant could make £500 carrying out a private cataract operation. 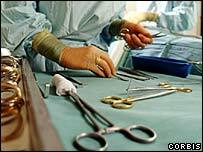 Like many NHS doctors in the 1990s, Mr Verma topped up his pay with work in the private sector. Patients were channelled his way either because they decided to pay for it themselves or the NHS funded the surgery because waiting lists were too long - in some places they exceeded two years. Either way, Mr Verma and his colleagues could nearly double their pay by doing the overtime. Nowadays this practice has all but gone. As part of the government's health service reforms, private clinics have been set up to carry out NHS operations in a bid to lower waiting lists. The clinics, officially called independent sector treatment centres, offer a range of fairly minor operations such as hip replacements and cataract surgery. Mr Verma, who spent 2004 working for Netcare, a South African firm that ran a mobile service in the first wave of treatment centres, said: "Patients would come up and kiss me afterwards. "In one weekend my team treated 200 people. Some of them had been waiting for months for treatment and without us would have faced a much longer wait. "We should realise the private sector offers us an opportunity to provide better and faster care. "But the problem is that many doctors are opposing it partly because they have lost money. That is not a reason to be against something." Mr Dinesh, who now works in a consultancy capacity for the NHS and independent sector treatment centre industry, accepts there are problems with the way the centres have been set up. The clinics currently have no responsibility for training new doctors and they are guaranteed a set number of patients meaning NHS facilities can be left idle in the meantime. "There are things that can be improved, and we should address them. But what we need is for the profession to be more constructive."